Tench (SS-417) was laid down on 1 April 1944 at the Portsmouth (N.H.) Navy Yard; launched on 7 July 1944 sponsored by Mrs. Claudia Alta (Lady Bird) Johnson the wife of Lyndon Baines Johnson at that time the Representative from the 10th Congressional District in Texas and later the 36th President of the United States and commissioned on 6 October 1944 Comdr. William B. Sieglaff in command. After completing trials and shakedown training out of New London Tench departed that port on 20 December for duty in the Pacific. 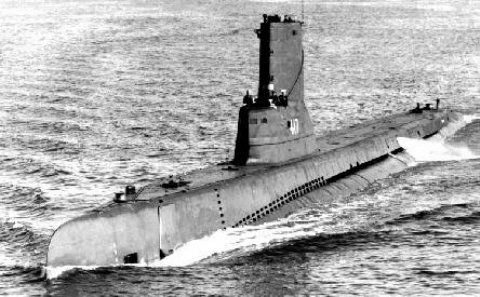 Following brief pauses for training at Key West and in the Panama Canal Zone the submarine reached Pearl Harbor during the latter part of January 1945. An additional training period followed her arrival in Oahu but only a brief one. On 7 February she stood out of Pearl Harbor bound for her first war patrol. After a stop at Saipan for fuel Tench returned to sea in company with Sea Devil (SS-400) Balao (SS-285) and Grouper (SS-214)-the other three submarines in the coordinated attack group to which she was assigned. They left Saipan on 27 February and headed for their assigned patrol area which began in the region of the East China Sea southwest of Kyushu and extended north into the Yellow Sea. On the night of 6 and 7 March Tench passed through the Colnett Strait-south of Yoku Shima-and into the East China Sea. The four submarines rotated patrol weather-reporting photographic-reconnaissance and lifeguard duties. On 18 March Tench received orders to take up lifeguard station off the western coast of Kyushu during 5th Fleet carrier air raids on Nagasaki. Just before the noon watch came on duty the submarine got word of a dye marker sighting by search planes. Presumably evidence of a downed Ameriean aviator the marker had been sighted in a bay on the coast of Kyushu near the town of Akune. Under the protective cover of F6F "Hellcat" fighters Tench threaded her way cautiously into the shallow waters of the bay. Just after she discovered that the "sighting" had been the result of a reflcetion of a shoal spot she received a severe fright. Caught in waters too shallow for her to dive she proceeded almost helplessly on the surface while a large flight of aircraft approached her from astern. Fortunately the planes proved to be additional 5th Fleet bombers returning from Nagasaki. Tench stood offshore and watched while they loosed their remaining bombs on installations near Akune: a railroad bridge a fuel dump and a factory. The remainder of March proved relatively unproductive. In the absence of targets worthy of torpedoes the submarine contented herself with the destruction of floating mines and with the sinking of two tiny trawlers on the 28th. Early on 3 April an enemy bomber forced her to dive and she ran submerged for the remainder of the day. That evening she surfaced once again and soon made radar contact with a good-sized target. The fact that the enemy ship carried radar-coupled with t he appearance of a second target larger than the first indicted that she was some type of warship escorting a merchantman. Darkness and fog dictated a surface attack. Tench's report claims that the target the large cargoman took one torpedo hit and erupted in a splendid pyrotechnic display. Unfortunately there is no evidence to confirm the kill. Tench's first war patrol had begun soon after the invasion of Iwo Jima and continued past the landings on Okinawa. American planners had foreseen the possibility of Japan's attempting to strike back at the Allied forces with what remained of the Imperial surface fleet. They therefore stationed a picket line of submarines off Japan to serve as an early warning system. Tench received orders to join that group of submarines before concluding her war patrol. She was on station off the western coast of the Japanese home islands when the Yamato task force sortied on 6 April to contest the Okinawa landings. Tench did not sight the enemy warship because they sortied from the Bungo Suido the eastern exit to the Inland Sea and the station assigned to Threadfin (SS-410). When that submarine sent her warning the picket line was disbanded and each submarine turned to its own individual mission. Some tried to gain advantageous setups on the Yamato force but Tench cleared the area for an air-sea rescue sweep of the East China Sea before ending her patrol. On 8 April she picked up the pilot and radioman from an Essex (CV-9) dive-bomber and then headed for Guam where she arrived on the 14th. Refit completed and her crew rested Tench returned to sea early in May for her second war patrol. That patrol took her again to the Japanese homeland but this time to the Tsugaru Strait between Honshu and Hokkaido which constitutes the northern entrance to the Sea of Japan. Her mission was to interdict Japanese shipping as it attempted to run north and south between the Kurils and Tokyo. Her first contact came on 25 May and proved to be an enemy warship. While patrolling on the surface she sighted a periscope approaching her out of the fog. She submerged immediately picked the enemy up on her sound gear and evaded him successfully. During the waning days of May she sighted little enemy shipping of consequence though her gun crews dispatched a number of motor luggers picket boats steam trawlers and other small craft to the depths. On 1 June however fortune began to favor the submarine. That evening she encountered the 861-ton Mikamisan Maru hugging the eoast of Honshu near Shirlya. Tench stalked her quarry until 0700 the next morning when she caught the cargoman about one-half mile off shore. In a surface attack the submarine scored two torpedo hits on Mikamisan Maru and sent her to the bottom. Two days later Tench scored a single hit amidships on the 517-ton Rgujin Maru which proved sufficient to sink her. For five days the submarine worked her way back and forth across the strait dodging enemy patrols and picket boats but without finding suitable targets. Then on the 9th she came across the big game of her wartime career the 2 857-ton freighter Kamishika Maru. Tench sank the merchantman in a submerged attack and spent the rest of the day evading spirited and pe rsistent enemy retaliation. The following day she dispatched an enemy tanker the 834-ton Shoei Maru No. 6 in another submerged attack. Again the Japanese spit-kit patrol force went after the submarine with everything it had but failed even to come close. In fact Tench's closest call was self-inflicted. On 11 June she crossed swords with a Japanese destroyer in a night surface attack. After firing a salvo of torpedoes at the enemy from her bow tubes Tench put her rudder hard over to turn a nd retired rapidly. Just then the lookouts reported one of her own torpedoes running in a wide circle and on a collision course with Tench. Frantic moments of evasive action ensued but the torpedo hung tenaciously on to its collision course. Once again fortune smiled. The torpedo ran deeply and passed directly under the submarine's stern. Tench continued her retirement unaware of the results of her attack-in all probability unsuccessful-but heartened by her escape from what had seemed cert ain destruction. After five more days of hunting enemy shippingduring which she encountered and sank a motor trawler with gunfire-Tench headed toward Midway Island. Following a refit there the submarine put to sea on her third and final war patrol. On 29 July she once again passed through Colnett Strait and entered the East China Sea. On the 30th she found another motor lugger and punched holes in her with her 40- millimeter gun. She then proceeded to round up the lugger's nine-man Korean crew all of whom had taken to the water at the first hint of trouble. Between 2 and 4 August she rode out an East China Sea typhoon and on the 6th released her prisoners in a small boat near the Korean coast. That afternoon she headed in toward the harbor of Osei To a small island near the western coast of Korea to conduct a shore bombardment. During that escapade her guns destroyed four schooners and severely damaged another five schooners a sea truck and a motor trawler as well as some warehouses and other dockside installations. Tench then shifted north to the Gulf of Pohai between the Kwantung Peninsula of Manchuria and the Shantung Promontory of China. Her last encounter of the war occurred on 9 August when she surfaced in fog to torpedo and sink a seagoing tug towing two large barges. While the submarine retired from that attack two Japanese "Betty" medium bombers dropped a bomb apiece some 500 yards off her port beam and then retired themselves. That ended her hostile actions. On 15 August the Japanese Empire capitulated and hostilities ceased Tench remained on patrol station until 28 August and then headed for Guam where she arrived on 2 September. After a brief stop at Apra she headed back toward the United States. Following stops at Pearl Harbor and Balboa in the Panama Canal Zone I>Tench moored at New London Conn. on 6 October 1945-a year to the day since she had gone into commission. In March 1946 she was placed out of commission in reserve at New London. Almost four years of idleness ended for Tench in Oetober 1950 when she eame out of "mothballs" to be converted to a Guppy 1A submarine. Over the next three months she underwent extensive modifications to improve her performance charaeteristies for submerged operations. In January 1950 the submarine was recommissioned at Norfolk Comdr. Frederiek N. Russell in command. Tench's second period of active service lasted just over two decades. For the most part she conducted routine training operations off the east coast. Initially she operated out of Norfolk as a unit of Submarine Squadron (SubRon) 6. While so assigned she made her first deployment to the Mediterranean Sea in January 1962. Upon her return three months l ater she resumed her schedule of east coast and Caribbean operations. During the summer of 1955 the submarine changed homeports leaving SubRon 6 behind for duty with SubRon 2 based at New London Conn. In addition to periodic fleet exercises Tench served as a school ship for the Submarine School located at New London. That employment continued until October 1961 at which time she stood out of New London on her second deployment to the 6th Fleet in the Mediterranean from which she returned earl y in 1962. Another extended period of duty with the Submarine School followed. That assignment was augmented by duty with various aviation and surface units in a series of antisubmarine warfare exercises. Early in April 1966 Tench broke that routi ne once again for a four-month cruise with the 6th Fleet. This appears to have been her third and last tour of duty in the Mediterranean. Upon completion of the deployment she returned once again to her New London-based training operations which occupied the submarine for the remainder of her active career. During the late summer and early fall of 1968 Tench took part in a NATO exercise Operation "Silvertower " in the eastern Atlantic. During that assignment she visited ports in the United Kingdom Germany and Portugal. The submarine returned to N ew London on 4 November and began her final 19 months of active service. Near the end of her career she was reclassified AGSS-417 on 1 October 1969. She was placed in commission in reserve at Philadelphia later that month; and on 8 May 1970 Tench was placed out of commission. Berthed at Philadelphia Tench remained in reserve until 1973. On 16 August 1973 her name was struck from the Navy list and she was subsequently scrapped. Tench was awarded three battle stars for her World War II service.